Smartphone's are coming to-day mushrooming powered on Android or iOS. Android most on Samsung Smartphone's and iOS on unique Apple iPhone. Due to the Smartphone war those two mobile Oases Android or iOS are in an open conflict for the taking cover of the majority part in the mobile market. The share they are going to capture not only by their physical appearance and physical performances but also by mobile OS. Android or iOS are the rapidly developing mobile OSes today we find other than windows. So those mobiles OSes ; Android or iOS must in a hurry to keep their clients to them. A smart OS war on Android or iOS .Therefore we find a lot developments and updates. In iOS we find instant news prompting service called" News stand" where you can get news on your hand with new App and let you read e-magazines on your way to anywhere and that save your time on going to a shop and buy a newspaper. But you can't have such kind of App in Android Apps store up to now and that claims no ownership for such kinda application. But the player used to find the tracks are being listened ;soundboard is better in Android than iOS as in Android it takes a long time then it takes in iOS. It almost takes about 13 seconds much than iOS. So this app used for that leads Android for a good competition in the mobile OS Android or iOS . There's a keen point that would be a bad for iOS. That 's Android is based on java ; the most popular and charismatic language used for programming and therefore Android OS is getting more advanced and enhances than iOS as it uses its identical programming language of objective C language that is used by a small amount of developers and hence there's a lack possibility to get its OS developed than Android . But its developers are being experts in that field it renders a yeoman service to iOS for its enhancements, a good reason Apple can always protect its unique features among other mobile OSes considering Android or iOS. We meet Android or iOS on the war of smart OS iMessenger; the only service available in iOS based mobiles is a sharing media that lets to share videos, picture and text to other iDevices such as iPad, iPod and so on without changing any text or distortion that file has to meet. On the other hand this can be used as a social networking App as this share the data among ios Devices users too, better chance for iOS war between Android or iOS. You can also share those text, pictures and other data through Wifi and it can be carries out in other iDevices as well. Geocaching App running on iOS shows faster and amazing performances as it does like in other web based apps. usually Apple's web based services are better than that of other s and keep going well longer considering Android or iOS. But I think that iOS developers may sometimes think that to develop it nothing more than being on a prison as they are given limits and restrictions when they are on the way to develop it and develop or create third-party apps is banned there to face war of Android or iOS. But in Android market there's no such kind thing, that means we can develop third-party apps and this leads Android has a leading and leaping improvement in mobile OS market than iOS. On social networking wise we needn't configure our twitter account often as once we log in t our twitter account and download the twitter app to iPhone we can get that account configured on our first sign in. But you can't have this facility on Android. This is the same for Facebook as there are much options for iOS Facebook version and a survey on internet shows more votes for iOS base on Facebook than that of based on Android. Look how it goes in net on war between Android or iOS. The amount of friends and messages are visible on iOS based Facebook while w e can't see them on Facebook based on Android and number of notifications and the friend request can be seen on Facebook based on iOS. Considering the functions on Android it's a multi functional mobile OS than iOS. But the problems arise regarding its performances and report faults and crashes. That may be due to the developments by novice, not master in the application designing. Photostream is another app that we only find in iOS systems and let sync photo to upload to iCloud account and can be used any iOS operating device and on iPad we can edit those photos. In the usage of Google translator we find a bit easier than in iOS. In pronouncing the words Android makes better performances than iOS and has a good successful time than iOS. So we find those developments meets Google's need as soon as possible because Android and Google translator are both own to Google Inc. There's no doubt that therefore Google is giving its full solidarity towards Android and to make more apps on Google's products in the war of Android or iOS. Today most of the internet users are addicted to Google's product I think all mobile OS must be redeveloped in order to meet those needs unless those Android or iOS will have to undergo difficulties. When consider this Apple iOS developers must be given the freedom to develop third party apps if it needs to remain unhide the world. They may think that they should make devices and OS only for the once using their products now and apparently no intention of attracting non Apple users. Here we see something regarding the testing Android OS better than that of Apple's iOS. 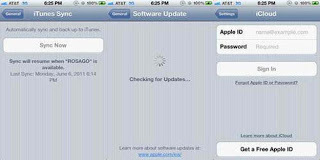 Apple gives a little chance is developers to create products and that may be one of the reasons why iOS was jailbreak on the very first day of its launch. So according to my point of view this is a great chance for Apple to have a flashback on what they are to do for the betterment of its products. So to choose Android or iOS is upon you and this is only a discussion on it.